Datarithm and PharmSaver are excited to announce an exclusive partnership. This partnership will leverage the data and analytic strengths of both organizations to deliver new and exciting value added cloud based applications to the dispensing pharmacy community. Datarithm delivers automated optimized order points by combining customizable settings and forecasting reached through analysis of each NDC/item's dispensing history. With accurate on-hands and optimized order points established, surplus inventory is quickly identified. 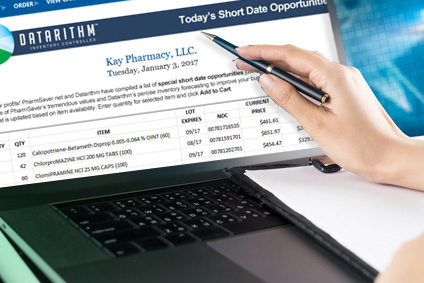 Datarithm's "return to wholesaler" and "store-to-store" transfer recommendations allow pharmacies to attack their daily surplus. PharmSaver has quickly become the premier pharmacy analytics and pricing platform in the marketplace. By leveraging its pharmacist friendly interface and creating the most dynamic pricing marketplace available the site empowers pharmacies to optimize their purchasing decisions saving both time and money. Through use of the PharmSaver platform pharmacies have in three short years saved millions of dollars in cost of goods while taking advantage of prospective reimbursement tools. PharmSaver is committed along with Datarithm to continue to deliver timely and industry leading analytics and tools. "We are excited to have an exclusive partnership with PharmSaver. We both deliver cloud-driven software applications that manage specific needs in the world of pharmacy inventory. Datarithm suggests to the pharmacy "what and when" to order while PharmSaver suggests to the pharmacy "where and how" to order. Datarithm and PharmSaver's independent applications, free of large company influence, provide the perfect one-two punch for purchasing and controlling inventory." "With this partnership with Datarithm we are excited to be able to augment the features of our platform and to enhance our ability to deliver focused and cost effective tools and analytics to the dispensing pharmacy regardless of it size or focus." Copyright (C) 2017 - PharmSaver - All rights reserved.